Figure 2.1. 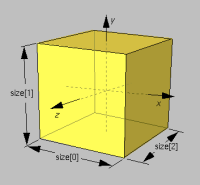 Scene graph of GeometryPrimitiveNodes.x3d scene. Figure 2.2. a. Screen snapshot of GeometryPrimitiveNodes.x3d scene. b. Screen snapshot of GeometryPrimitiveNodes-White.x3d scene. Figure 2.3. Definition of size dimensions for a Box. Figure 2.4. Example Box screen snapshot. Figure 2.5. 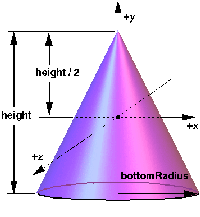 Definition of height and bottomRadius dimensions for a Cone. Figure 2.6. 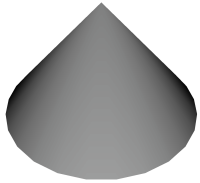 Example Cone screen snapshot. Figure 2.7. 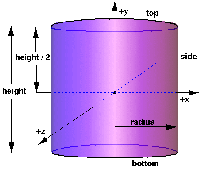 Definition of height and radius dimensions for a Cylinder. Figure 2.8. Example Cylinder screen snapshot with top="false". Figure 2.9. 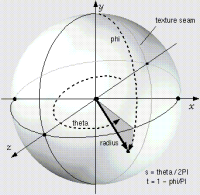 Definition of radius dimension for a sphere. 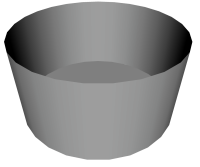 Figure 2.10. 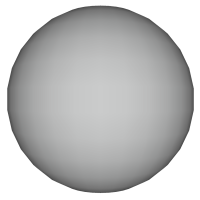 Example screen snapshot of a sphere. 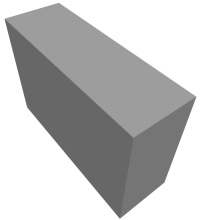 Figure 2.11. 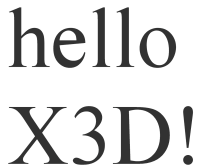 Example scene demonstrating the effects of varying FontStyle node parameters. Green boxes indicate selected values. Figure 2.12. The same scene with . Green boxes indicate selected values. Figure 2.13. An example of the Text node showing two lines of text.